Arlanza is a quiet little village located along the hillside near the Noceda River. Etymologically Arlanza comes from the root “Ar” meaning “water” or “wellspring.” This village gave name to the river that runs from side to side of this area and was recorded in the 1011 year archives. The origins of this idyllic village rooted in Later Iron Age, 5th century B.C. This Arlanza distant past is seen through the various archaeological evidence from High Roman Empire. Arlanza is also a magnificent example of rural architecture and traditional houses built with local materials, with the peculiarity that some of the houses take advantage of the natural rock basements. A walk through the alleys is essential, they are silent witnesses of past histories. You’ll see the laundry with its source or shoeing and if you’re lucky could discover forgotten trades craftsmen, as well as lovely and welcoming people. Nature is part of the town. Do not hesitate to get lost on “Camino Olvidado” (forgotten path), a stretch of the old Camino de Santiago which flows into the village of Labaniego that it runs by chestnut trees and oaks with pleasant murmur of water between mills and the ruins of an old monastery. 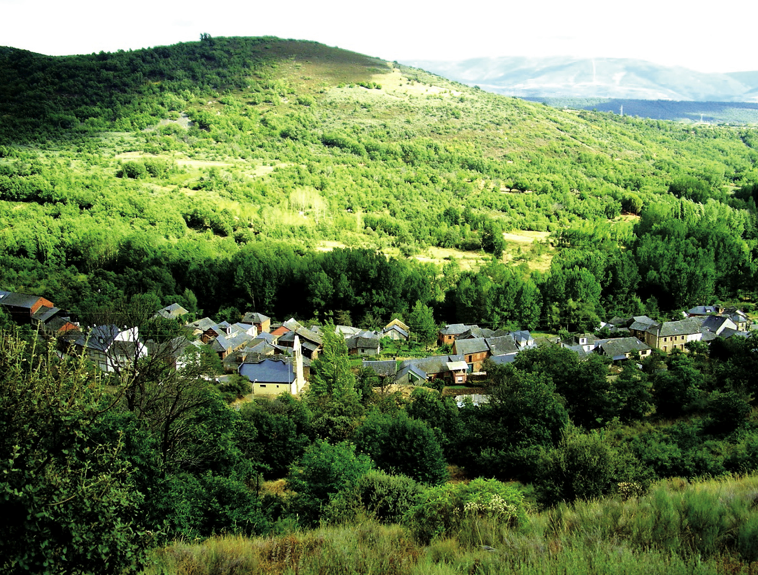 Arlanza is the perfect starting point to discover the region of “El Bierzo”. It is amusement, culture and sport epicentre. Countless villages with traditional architecture, some of them asleep at the time, like Colinas del Campo, Peñalba de Santiago or Molinaseca. Monumental and medieval cities as Ponferrada (capital of El Bierzo) Astorga (Roman villa) or Villafranca del Bierzo. Precious and endless water ways forests, oak, chestnut and beech, such as Busmayor. Unique beauty landscapes as Los Ancares Leoneses, ancestry and tradition, magostos, rivers, lakes, cloudy summits snowy in winter, such as Pico del Catoute or Montes Aquilanos. Silent valleys as Valle del Silencio, endless trails streaked, Las Médulas (declared archaeological heritage place), mills, forts, monasteries such as Santa María de Carracedo or San Pedro de Montes, Templar Castle of Ponferrada or Cornatel’s, with its medieval magical nights in August. Remnants of the past like an actual avant-garde, theaters, culture, museums (Bierzo’s Museum and Ponferrada’s Energy Museum are highlighted), food, wine, services, entertainment and leisure, skiing, canyoning, hiking, adventure sports … and all with excellent communications. It is difficult to summarize what the traveler will find in this region, but is clear if you come you’ll want to come back, because this land does not leave anyone indifferent and in every season comes a new Bierzo. -> Watch ENVIROMENT photo gallery.